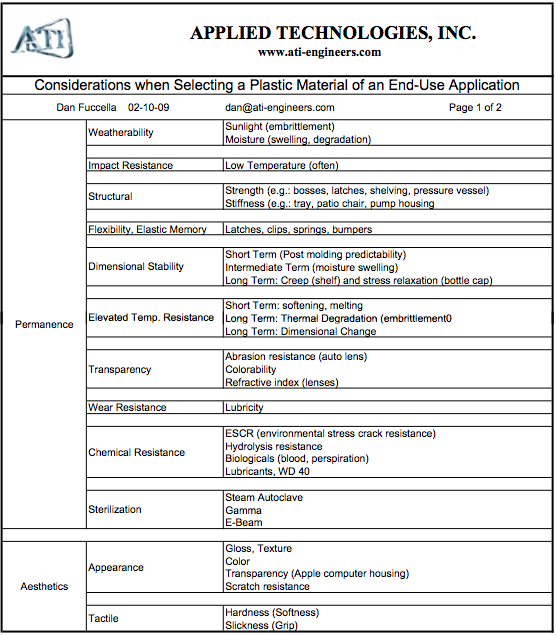 Selecting an Appropriate Plastic for an End-Use Application This downloadable guide is a spreadsheet of important characteristics to consider when selecting an appropriate plastic for an end-use application. Rather than suggesting the plastic or listing characteristics, this guide highlights specific considerations that must be made before choosing the right material. Once the relevant factors are identified, it will be easier to find and select a plastic that meets the requirements of the application. Contact ATI’s plastics experts for further guidance defining requirements and selecting the best plastic material for the job. This guide is free to be used and distributed courtesy of Applied Technologies, Inc. Distributed courtesy of Applied Technologies, Inc.